A great variety of Christian symbols have been turned into tattoo images, none more so than the cross. Christian cross tattoos portraying a variety of the cross are always abundant; after all, this is the most appropriate and most familiar Christian image of all. Some cross tattoos show Jesus on the cross, while others show the cross, often with realistic wood graining, with a crown of thorns hung over one arm. Other cross tattoos consists of crossed nails such as big, rough looking nails like those that were used to hang Jesus on the cross. Other popular Christian cross tattoo images include the Celtic cross (probably one of the most popular Christian tattoos of all), the Russian cross, and the Egyptian 'ankh', a cross with a circular shape on top, the ancient Egyptian symbol for 'life'. 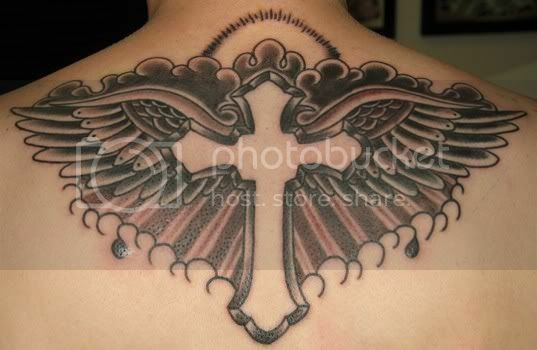 Besides the cross, there are other Christian images that are often used in Christian cross tattoos. The fish symbol is a great illustration based on assorted biblical references, a stylized fish symbol is frequently used as a symbol of Christ. This is a compact, but quite prominent symbol that lends itself well to tattooing, especially in black. However, there are also other tattoos that may be gang related such as the Hispanic Christian Cross Tattoos. They are an interesting sub-group. If you know anything about their traditions, you won't be too surprised to learn that most Mexicans and other Hispanic people, even though they are involved in gangs or other criminal activities, are deeply religious and rely on their Christian symbols to both identify and protect them. These Christian cross tattoos are rather complex, many involve a tattooed image of a saint, Jesus, or the Virgin Mary. Hispanic tattoos often have words, as well, usually a Bible verse, perhaps accompanied by a loved one's name. Many Mexican gang members have multiple sophisticated tattoos, allowing the individual to literally wear his identity and emotions on his skin, if not his sleeve!